The originality of a campsite is often found through its fun leisure facilities. To better distinguish themselves, some campsites invest in very spectacular equipments. Even if the water parks of these campsites are the most striking example, other attractions can equally stimulate the curiosity of tourists. From high ropes courses to giant zip-lines, from water skiing to indoor game rooms, find the ten most spectacular attractions on French campsites in this thematic file! Since the mid-2000s, the camping and caravanning industry doesn't stop to upgrade its facilities, this is notably the case for the accommodations, with more comfortable, more spacious and better adapted mobile homes. While the water parks get more and more impressive, new attractions also have emerged. 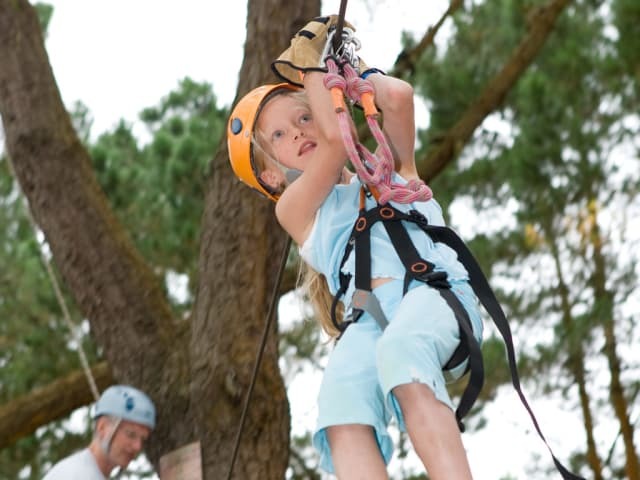 Among these, high ropes courses and zip-lines have been multiplied on campsites. After all, many of these are settled in beautiful wooded areas, and therefore benefit of this environment to develop their own adventure park. Several meters from the ground, watch out for dizziness! Young and old will be equipped in an appropriate way to avoid dropping and the activity is very well supervised. Climbing, crossing rope bridges, there are even zip-lines on certain campsites, everything to satisfy thrill and high speed seekers! Located in Dol de Bretagne, in the north of the Ille and Vilaine, at a few kilometres from Mont Saint Michel and Saint Malo, Le Domaine des Ormes belongs to this category of campsites where it is impossible to get bored! Its 250 hectares contain in fact so many attractions and fun facilities that tourists staying here don't know where to start to have fun and entertain themselves! Besides the 18-hole golf course, this campsite boasts for example five water parks, a pond on which it is possible to go water biking or practice many sports facilities. Among these, we find on Domaine des Ormes a climbing wall, a paintball field, an archery stand, an adventure course and an infernal tower. It allows to climb on large zip lines, accessible to children as from 4 years old. And because there are three lines, it is possible to race against each other..
At two steps from the Morbihan Gulf and the beach resort of Carnac Plage, La Grande Métairie counts as one of the most beautiful campsites in South Brittany. Its various leisure and sports facilities make it an ideal destination for a family holiday. Besides its great Water Park, its skate park, its mini-farm, its pony-club, etc. La Grande Métairie features a beautiful Adventure Park. 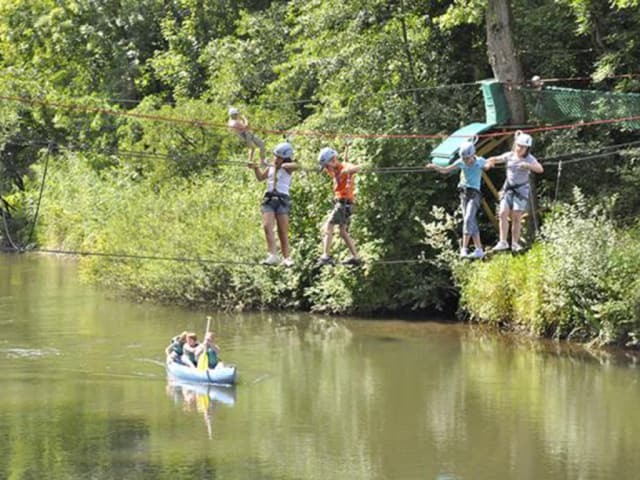 As from 7 years old, campers can climb over the hanging bridge, the gangways, the climbing nets, etc. A 400-metre zip-line allows you to fly over the village! In the heart of the South-West, between Villeneuve sur Lot and Cahors, Le Domaine Duravel is a beautiful campsite situated at the edge of the Lot. Ideal for families, it has a water park, a pier on the river to launch a canoe into the Lot and many other leisure facilities. Located in the heart of the Touraine, Le Parc de Fierbois is nestled in the middle of a forest and at the edge of a pleasant water body. With its great Water Park, its sandy beach and all its organised activities, it is a dream resort for anyone wishing to spend a holiday in the Loire Valley. 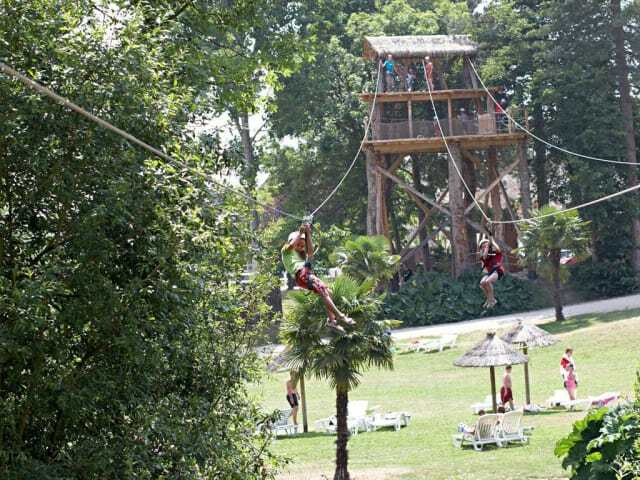 Open during high season, in July and August, the Adventure Park of campsite Parc de Fierbois allows tourists to walk around from tree to tree. According to the level of each and everyone, the course takes between 20 and 45 minutes. It is only accessible to adults and children over 1m35. There's also a zip-line to cross over the lake. East of Valence, in the Drôme, lies campsite le Domaine Le Grand Lierne. Perfectly located, it offers tourists staying here the opportunity to discover the Provence and the Vercors, and also to have fun through its leisure facilities and the activities organised here. Like le Domaine Duravel, mentioned here above, le Domaine Le Grand Lierne is a campground operated by the France Loc Group. It therefore features a for the least surprising playground for children where the Elf Carabouille lives. But no need to worry, the youngest can take over the place and wander over the gangways and enjoy the slide! In the heart of the Sologne lies campsite Les Alicourts Resort. Located between Orleans and Vierzon, it counts as one of the most beautiful campsites in the centre of France. With its 9-hole golf course, its wave pool and covered pools, its skate park, its playgrounds for children and its 'Baby Paradise' area, this campsite already offers many spectacular facilities. But what to say about its water ski facility? The Alicourts Resort is indeed the one and only French campsite to dispose of its own water ski facility. As its name suggests, this facility enables to practice water skiing on the water body of the campsite. But unlike normal water skiing, where the traction is provided by a boat, it is done with the help of a cable system, similar to those used in the mountains to facilitate the access to the top of the ski tracks! 5-star campsite in Bénodet, Le Port de Plaisance welcomes every year many tourists wishing to spend their holiday in the South-Finistère, just two steps from the sea and the beaches. Among its leisure facilities, the Accro' Bat is a great adventure park offering sensational thrills! Located at the entrance of Le Port de Plaisance, the Accro' Bat is composed of three courses. The first is specially intended for children of two years and older. Parents accompany the child from the ground, and everybody is equipped with a harness and snap hooks. The second course is open to children as from eight years old, while the third course is the most impressive. In the middle of it, a zip line of more than 50 metres awaits the teens and adults, giving them the opportunity to fly over the campsite's Water Park! Located in Messanges, in the Landes, Le Vieux Port is the campsite of superlatives on the Côte d'Argent. 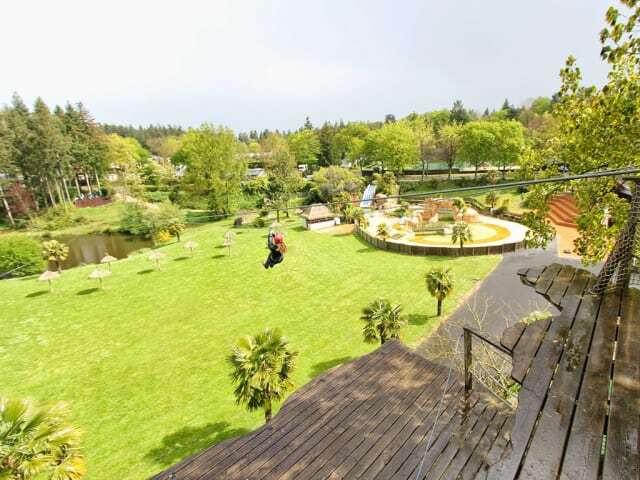 With its Water Park of 7,000 m², its hydro-relaxation area, its wellness centre, its playground, its horse ride centre, its city stadium or even its countless sports facilities, this 5-star campsite is one of the best equipped campsites of France. But this doesn't stop them from being innovative, over and over again, to satisfy their guests even more. 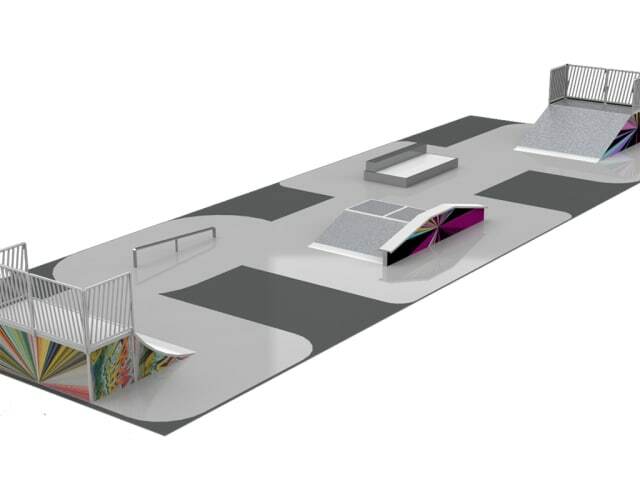 Thus, in 2015, Le Vieux Port becomes the first campsite in the Landes to build a skate park. With its quarter-pipes, its bar slides and various other modules, this skate park is the ideal place for slide lovers (skate park, roller skate, BMX)! Located in Bonnal, in the Doubs departement, Le Val de Bonnal counts as one of the best campsites in the East of France. Its geographical location, by the river and near a lake, as well as its many facilities, offer campers a wide choice of fun activities (canoeing, swimming, fishing, etc.). Le Val de Bonnal also features its own Adventure Park. Exclusively reserved for kids and teens, the activity is only open during high season. 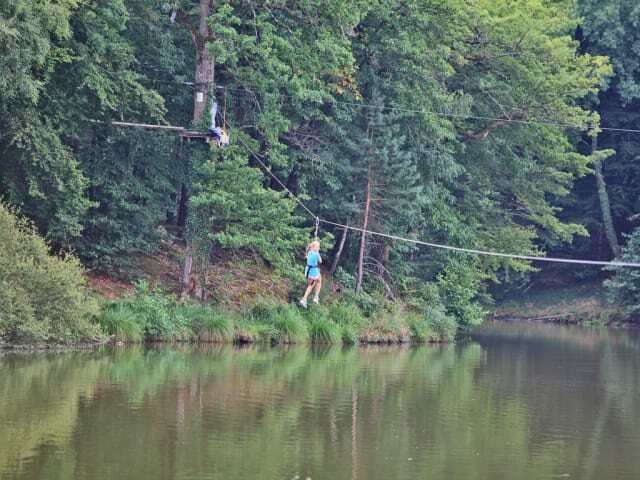 The course lasts about one hour and a zip line allows to fly over the river! 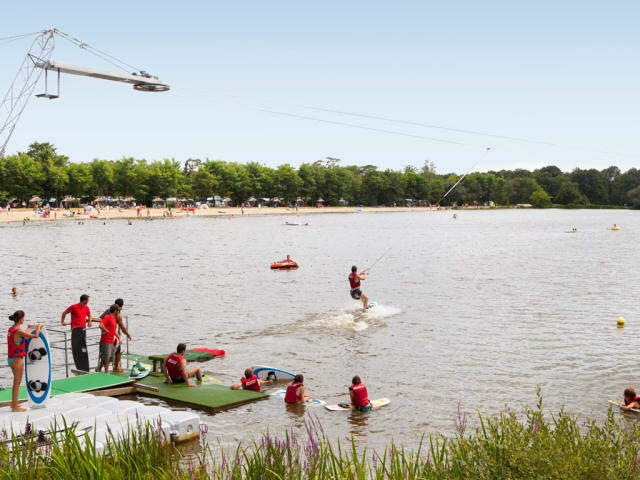 While covered playgrounds for kids and teens are multiplying in urban outskirts, campsite L'Atlantique in Fouesnant was the first outdoor holiday resort to be equipped with such a construction in France. 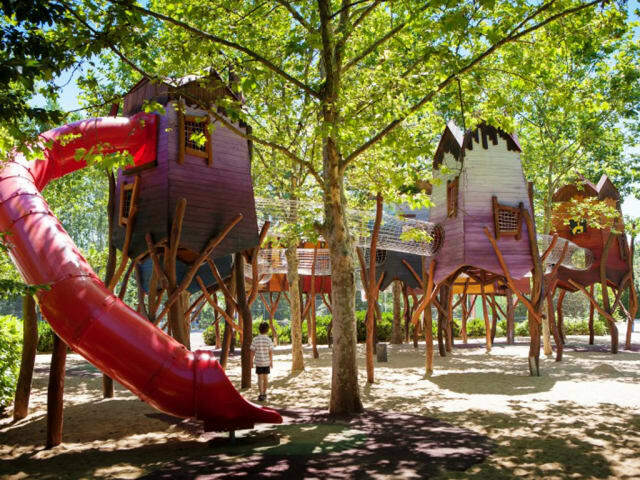 Named "The kids island", this playground extends on a covered surface of 600 m². 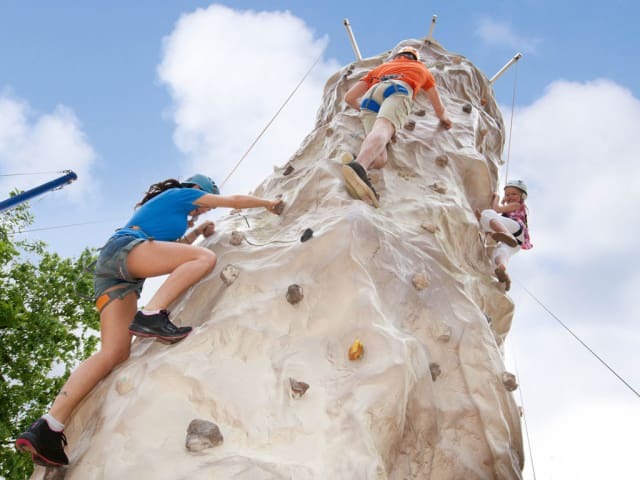 Decorated on the theme of pirates, it is open to children and teens of the campsite who can enjoy a multitude of tubular games, inflatable structures, new-generation console and touch screen games integrating various fun activities. 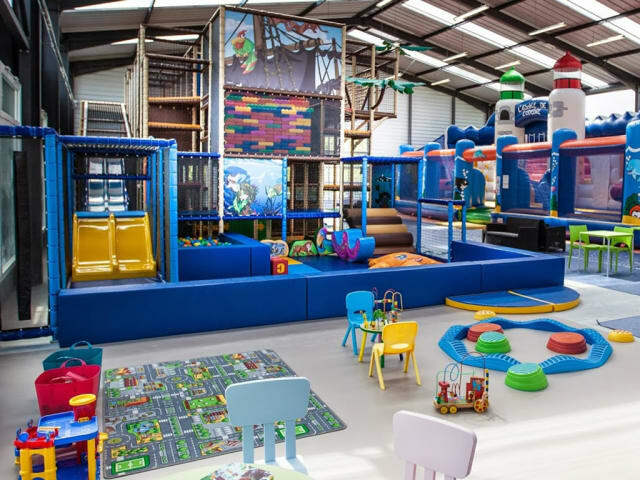 True paradise of entertainment, this "kids island" also has a bar permitting parents to have a drink while the youngest have a wonderful time playing!